In my last article, I talked about how modern vampires have been “de-fanged.” There are, however, many movies (old and new) where vampires still act like vampires. This is my list of vampire movies that still have some bite. The vampires in this list don’t sit around crying about their horrible lives. They’re still villains. They’re still monsters. And since we’re all horror fans here, I think we can agree that it’s fun to see a monster act like a monster. One note: These aren’t reviews of the movies themselves. This is simply a list of movies with vampires that are still… well… scary. Jerry Dandridge is quite possibly the coolest vampire to ever roam the night. His charm, humor, and sadistic nature make him an absolute joy to watch… but you definitely wouldn’t want him as a neighbor. 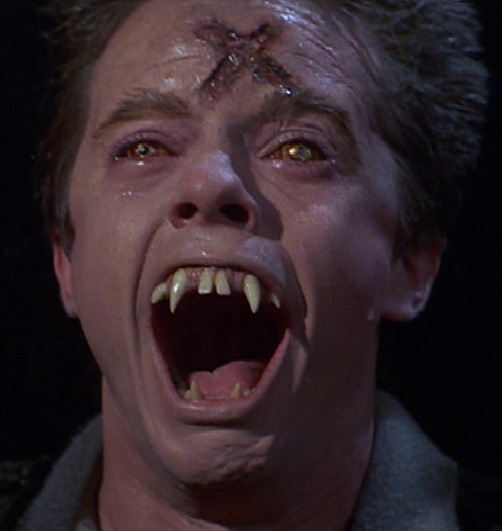 I personally recommend the original Fright Night. I didn’t hate the remake, but (in my opinion) nobody can top Chris Sarandon as Jerry Dandridge. When David said this line as he wiped the blood from his mouth, you could see one thing in his eyes: Joy. These guys love being vampires, and Kiefer Sutherland portrays that wonderfully. If you’re looking for monstrous vamps, this is the movie for you. They are hideous, evil, and they come in hordes. The vampires may not be scary in the traditional sense, but they are without a doubt fun to watch. Yes, this is a TV movie. Yes, it can be incredibly cheesy at times, due to its age. Yes, the lead vampire (Barlow) is nothing like he is in the book. But when that Glick kid floats up to the window and starts scratching and whispering, “Let me in,” you have a truly chilling vampire scene. And when the vampire is sitting in that rocking chair, saying, “Teacher,” it’s impossible to deny the creepy-factor. This movie does have the standard romantic angle (which I don’t like; it’s not in the book at all), but the vampires in this movie are classic. Dracula is really the least scary vampire in the movie. His “brides” are eerie and when Lucy enters her crypt carrying a baby… that is a genuinely scary movie moment. That’s five classic films where vampires act like vampires, but this list is far from complete. There are many, many more. In modern films, they’re harder to find, but they’re definitely there (30 Days of Night comes to mind). If I missed any that you feel should definitely be included in this list, feel free to list them in the comments section (or even on the Facebook page). We’re definitely interested to know what you consider the best vampire movies that still have some teeth.